The weather has been uncooperative for fishing lately so I’ve been working on some projects. Pretty happy with them and its nice that they don’t take long. I’m off to the mainland for a month but excited to fish when I get back in late April. I’m not a fan of cutting holes in a boat. I use 3M 5200 Marine Adhesive Sealant and roughen and clean the surfaces. It gives a good watertight bond for about a year, then I just redo it. I try to be mindful of stress points “hard edges” so to speak. 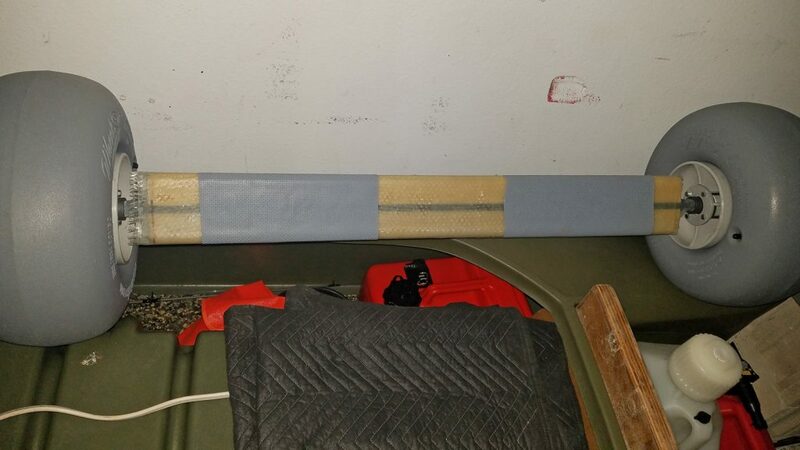 I’m going to glass over the mdf on the transom and braces at some point for extra protection, and I’ve placed a fish bag on order that should fit perfectly. Was able to go fishing today. Left the house at 4 and was out in the water before first light. I made my way from the west side of the island out to a point that I’m very familiar with and a good first fishing run as I’m getting my routine together and used to the new setup. On top of a new boat I’m changing my fishing style from trolling to catching and using live bait. We get large mackerel scad locally called “opelu” which I have never fished for before so it was all new to me. 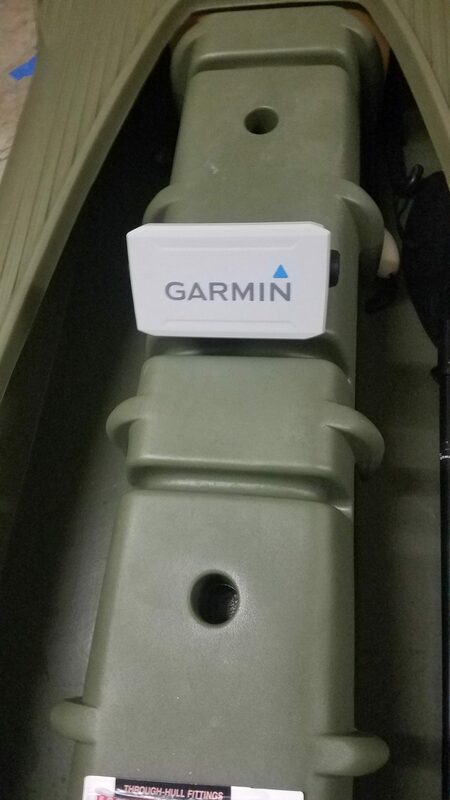 I installed a Garmin 64cv and boy I’m glad I did. Not only was it great for marking bait I could see the depth of my damishi used to catch them. I was able to get 4 of them which isn’t bad for my first try (figuring out what colors and hook size). They are large bait, nearly a foot and fight hard while having a fragile mouth…. 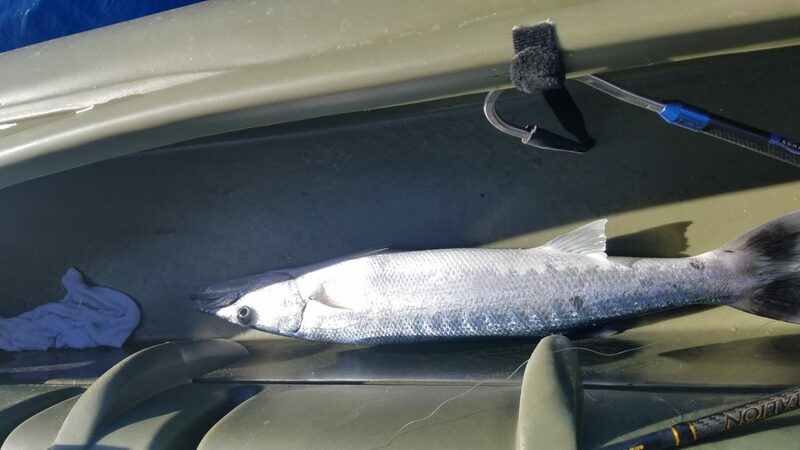 I bridled up the first one and 5 minutes later I noticed he was running along the surface which I thought odd, all of the sudden the water exploded and I saw the flash of a big ono (similar to king mackerel) my reel started screaming and the drag froze on the run….. ugh!!! That got my heart going. 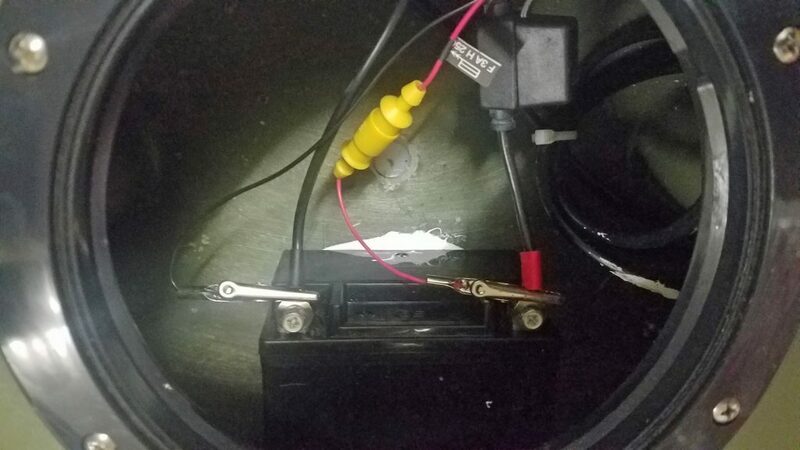 I had 2 more bite offs (using wire) and caught the cuda fly lining a piece of opelu that got sliced in half, there were 3 cuda taking turns with it. Right when he picked it up 3 mahi swam right by, if id just had waited a minute! The water clarity was about 80 feet so I could see straight below the boat for the action. Also had a humpback come by and check out the S4, he gave me quite a show with a couple large tail slaps before making his way up the coast. It was a choppy confused sea today. There was a large north and a northwest ground swell of medium period that rolled by like hills, the south wind started driving a 1 to 2 foot chop on top directly opposing that made it snotty. I didn’t win any speed records but cruised along at a leisurely 6 knots and riding it comfortably on the saddle seat. The boat did terrific, and the stability and safety I felt with it were great. Catching bait, fighting fish, messing with the fishfinder and re tying cut off lines, I never had to worry about stability. Looking forward to next weekend! Getting my go pro mounted this week is a high priority! Got to go out today finally! 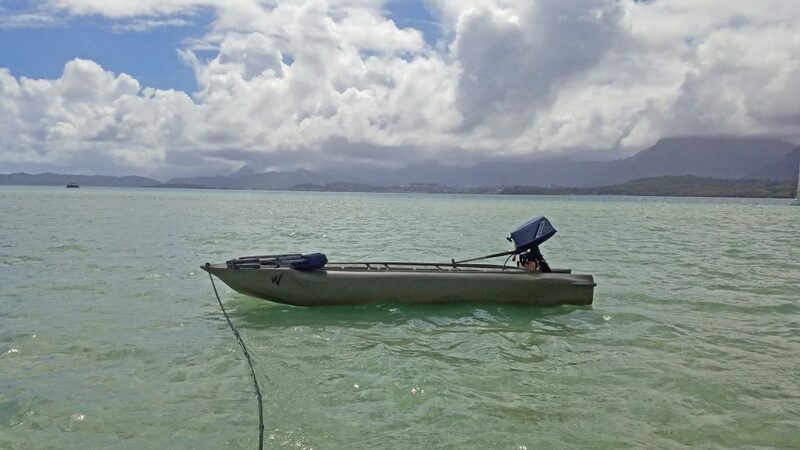 I headed over to Kaneohe bay to run out to the sandbar a 2 mile trip and brought my beach chair along. The tide was running high so the sand wasn’t dry and I didn’t get to beach and break out my chair for a nap so I enjoyed taking a nice long walk across the bar enjoying watching the smaller fish, turtles and such that frequent the area. The S4 did very well, a lifelong boater I am impressed at both the function and obvious time spent to design a craft of such function at this size. The winds were 25 knots and while it looks calm in the pictures that is only because it was about 8 inches deep and the sandbar is quite large which knocks down the chop. Outside the bay were large breakers and inside for the trip across it was a short period 1 to 2 foot chop, the boat did just fine. I really enjoyed how I could run way up in the shallows with no concern and just how easy the boat made the trip. While the big boats could make it there quicker by the time they carefully anchored at the drop and they had to jump in chest deep I was already in the better spot! 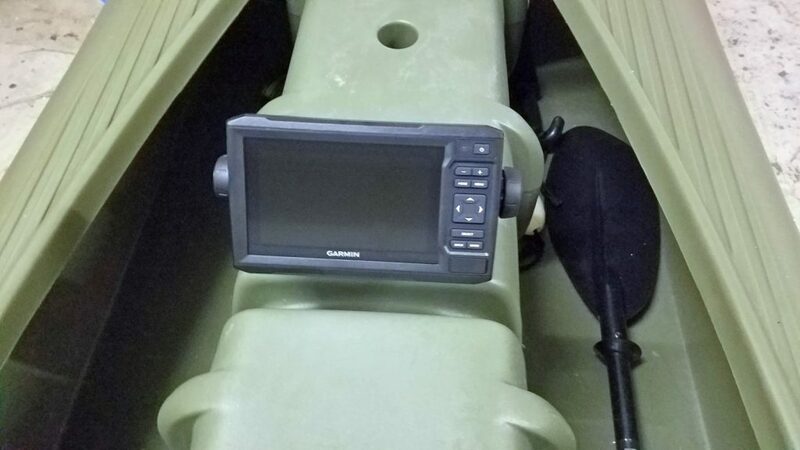 I have purchased a Garmin fishfinder and will work on my fishing set up tomorrow. Going to take it fishing on Monday! Hopefully I’ll get some beginners luck! 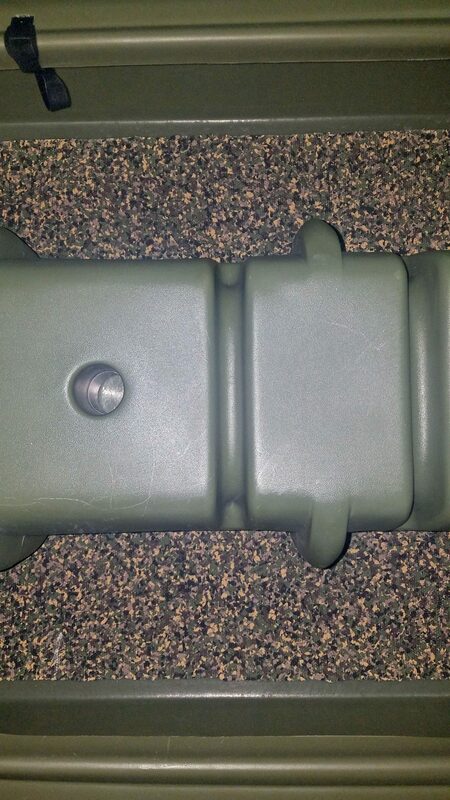 I’ve attached some pictures of my last 10.5 bullfrog tender. Rotomolded sponsons. It turned me on to microskiffs before they got trendy. Slightly over powered 🙂 with a 40 hp before port n polish, carb and tuning work. I never GPS’d it because I had to keep one hand on the tiller and the other on the rail! Numbers told me it was somewhere in the 30s, it always overreved, i had a 13 inch prop but it could have spun a 17 or 19 with ease i think. 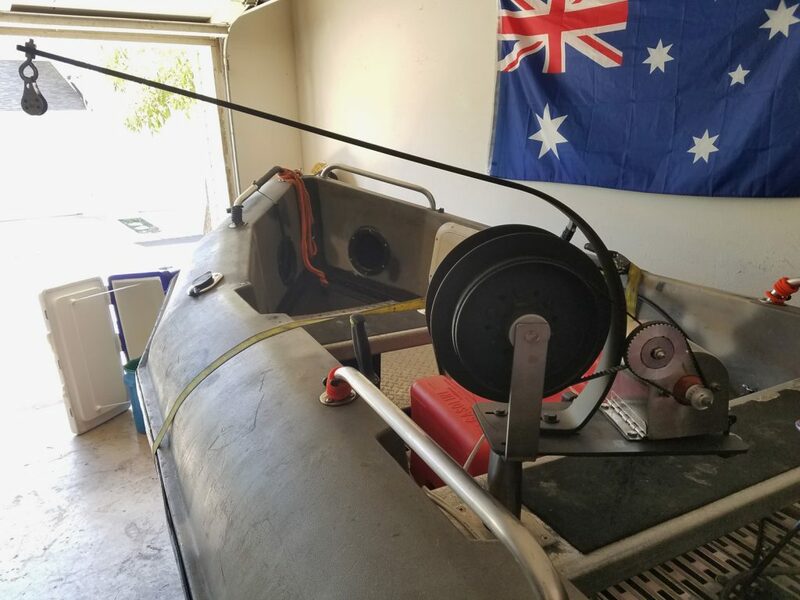 It was about 10 years old and had to retire it from service as the aluminum hull and rivets finally gave way to crevice corrosion and she would take on water. The weight and torque of the 40 hp Johnson probably didn’t help! 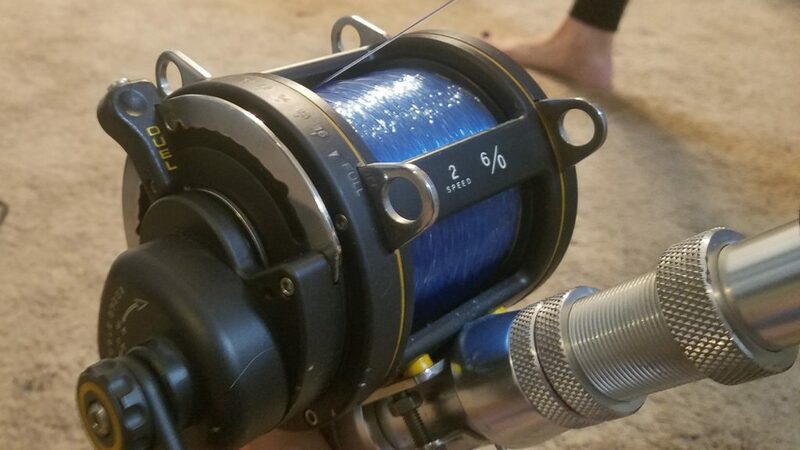 The crab pot looking power reel is locally made and called a “henry ching”, simple deep drop electric reel used for queen snapper that are down around 1000 ft.
A boat is deemed seaworthy if it is built and outfitted for a voyage at sea. By extension, when small boats are concerned, going on big lakes requires a seaworthy boat as well. A portable boat can be easily carried or moved, especially because of being lighter and smaller than other boats. Skiffs are flat bottomed boats designed for fishing flat water. Micro skiffs (microskiff) are smaller skiffs designed to do the same. These boats draft less than other boats that are made for fishing in deep water, and offshore. When used on flat water, skiffs and micro skiffs are relatively stable for their size, but they don’t excel when seaworthiness is concerned. Some skiffs and microskiffs can handle waves better than others, due to a somehow different form of their hulls called Shallow V Hull that feels less stable on flat water. But going with these boats through choppy water, let alone rough water, is uncomfortable at best, as typically, the passengers feel unstable, and get tossed around. This is to say that as a general rule, boats that are made primarily for going on flat water are not among the most seaworthy. Portable microskiffs are smaller than the typical microskiff, and as such they are less seaworthy. 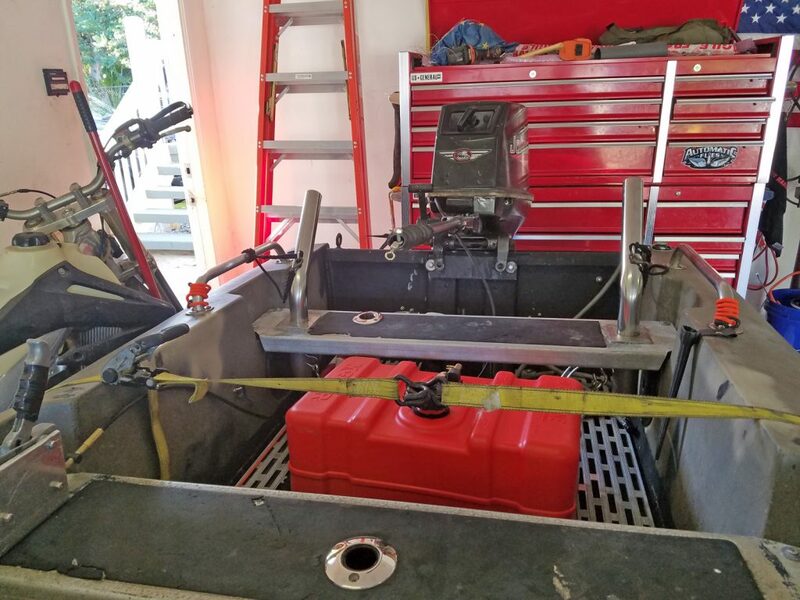 In order for a boat to be portable, it must be small and lightweight enough to be car-topped, and carried to the beach either by dragging it on the ground, or with a lightweight wheel cart. 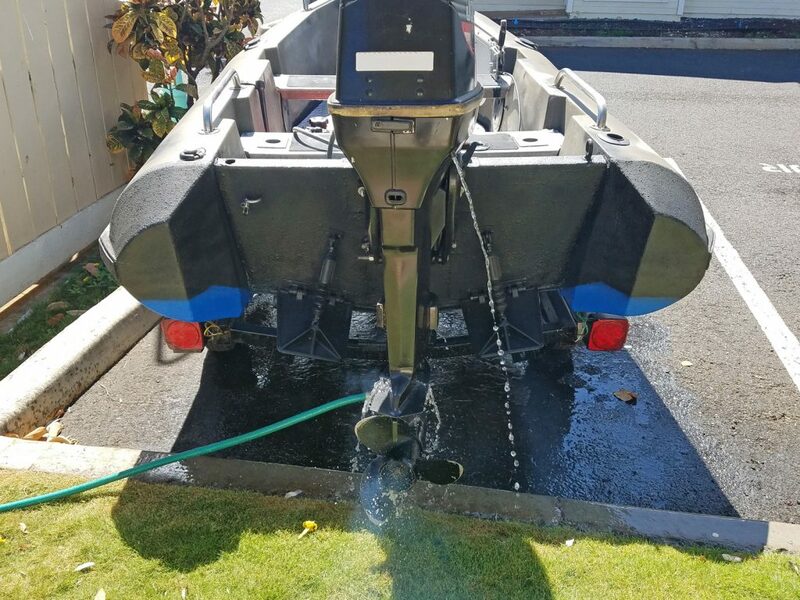 Typically, microskiffs that offer these advantages are not full fledged boats – They are boards with little or no free board, whose decks get washed by water and spray even when they go in mild chop. The only full-fledged portable microskiffs are the Wavewalk 700 and Wavewalk S4 that offer sufficient free board to offer reasonable protection to their passengers and gear, as well as sufficient stability and balancing capabilities when going in rough water. 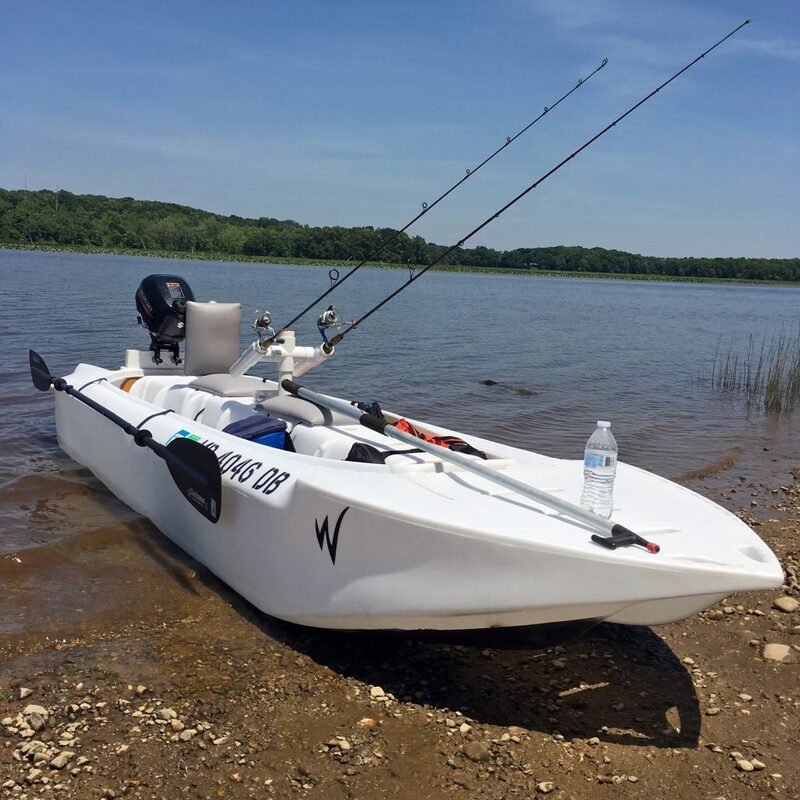 Despite their similar catamaran design that’s based on Wavewalk’s patented invention, the W700 and S4 are two different micro skiffs in terms of performance and capabilities. 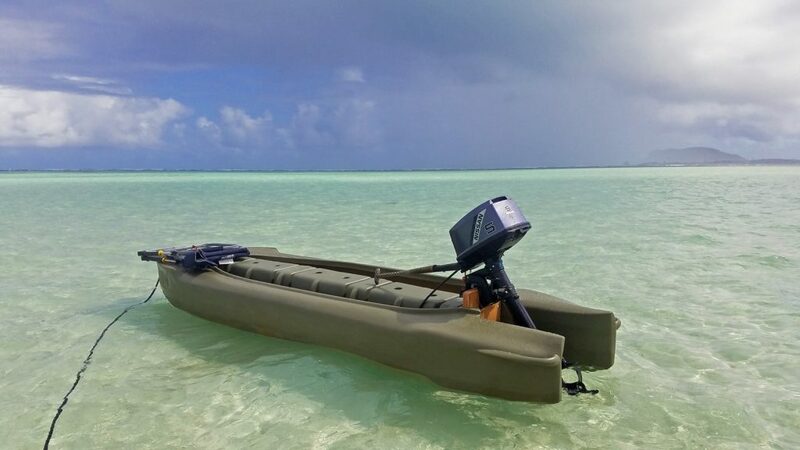 The W700 can be described as a hybrid kayak-microskiff. 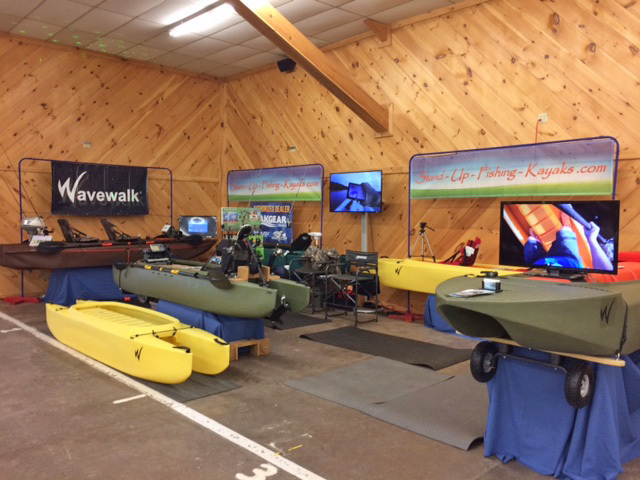 It is extremely stable even in comparison to the biggest ordinary fishing kayaks, and it paddles very well with a crew of one or two, and up to three medium size paddlers. It can be driven with an outboard motor of up to 4.5 HP, at speeds over 10 mph. 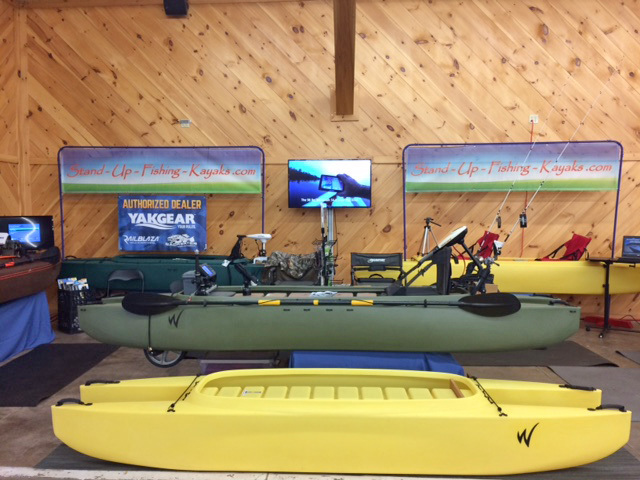 The W700 offers stand up paddling and fishing to up to two anglers, and its on board storage capacity is greater than the storage offered by any sit-in or SOT kayak. The W700’s light weight (80 lbs) makes it easy to carry over long distances and rough terrain, including rocks and deep sand. 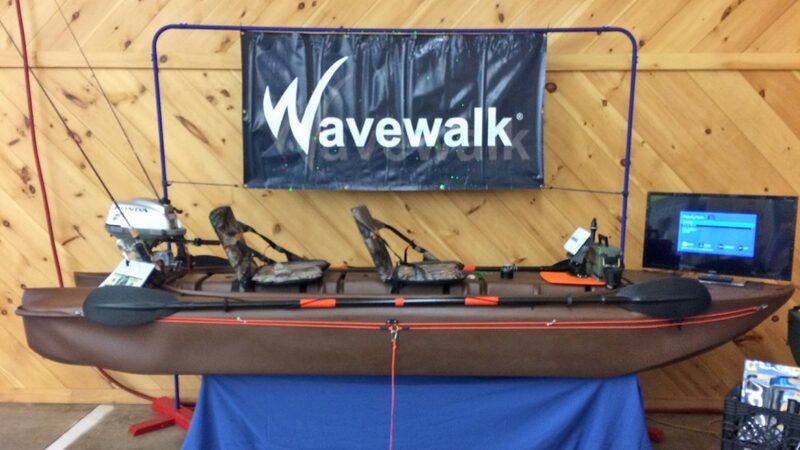 The W700 also works perfectly well as a canoe, namely with single-blade paddles. The S4 is more stable and more seaworthy than the W700, its load capacity (payload) is greater, and it has more room for passengers and gear. On top of this, the S4 can be driven with much bigger and more powerful motors, at sustained speeds of 17 mph (with a 10 HP outboard). The S4 weighs 20 lbs more than the W700, and it is likely to be outfitted with a more powerful, and therefore heavier motor, it is less easy to carry over rough terrain and deep sand. This said, the S4 is a car-top boat that one guy can handle without a problem. The S4 also works well in a paddling mode, with both kayak and canoe paddles. The performance of the S4 is in rough water is most impressive, even compared to inflatable dinghies that are designed primarily for going in rough seas. The S4 easily handles waves of up to 4 ft, while its driver and passengers ride its saddle in comfort and confidence stemming from the fact that they can balance themselves easily and intuitively, in the most effective way, being supported by their own legs and a large size hull on each side. 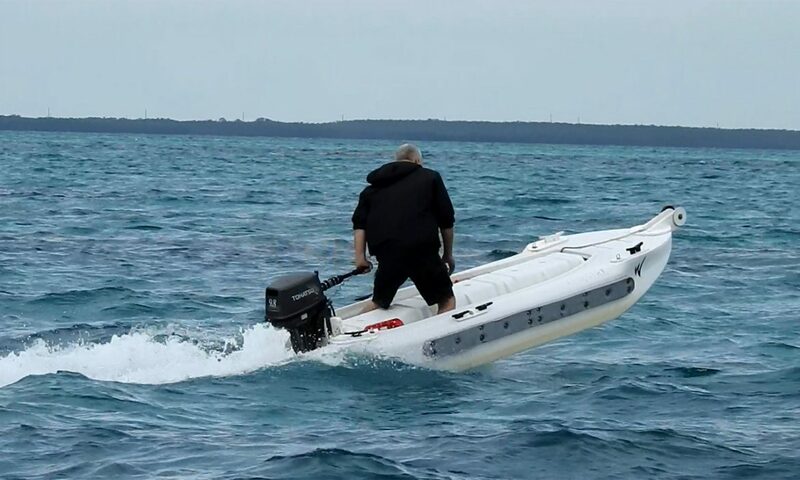 The saddle in Wavewalk’s micro skiffs is of similar size and dimensions as the saddle featuring in large-size models of personal watercraft (PWC), often referred to as jet-skis. Similarly to jet skis, the driver of an S4 can drive it standing up, even in choppy water. 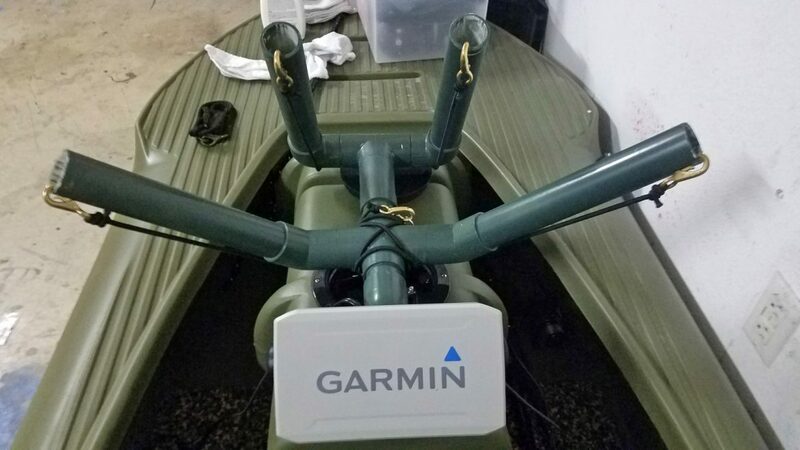 Similarly to micro skiffs skiffs, the S4 features a front deck that an angler can stand on and cast, although probably not in the presence of waves. 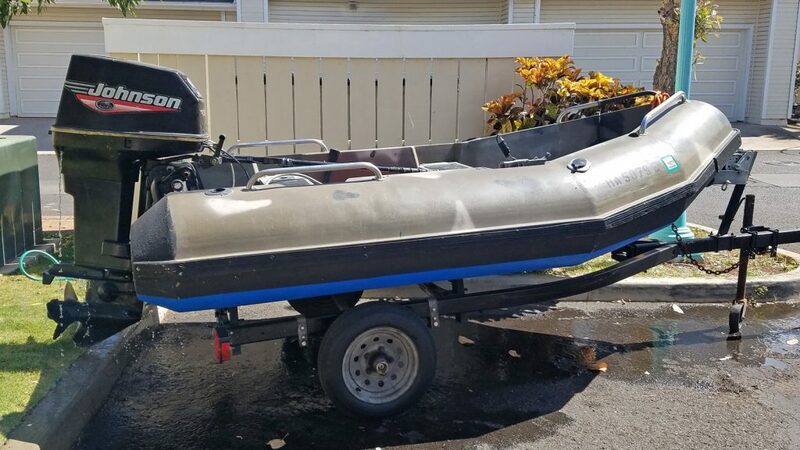 The S4 can be outfitted with accessories such as a wheel cart that can be carried on board, and a large-size, detachable spray shield that protects the front passenger from being sprayed when the boat goes in waves at high speed. 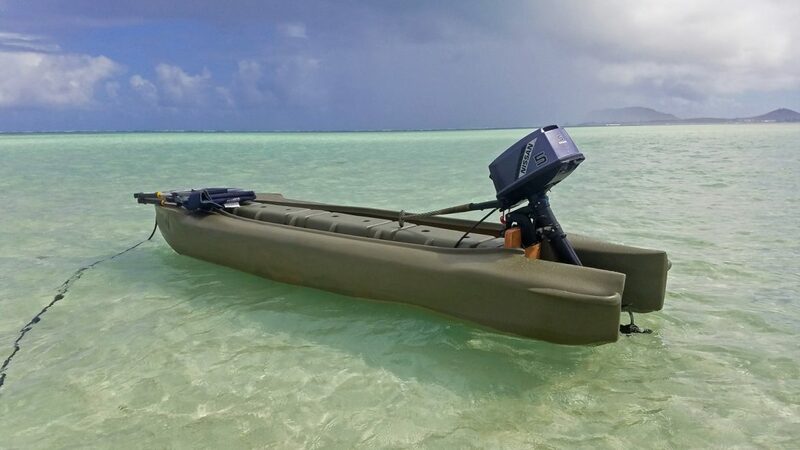 The S4 micro skiff is more stable than other skiffs its size, and unlike typical skiffs, it is not made from fiberglass but from Polyethylene, which is a resilient and more durable material. 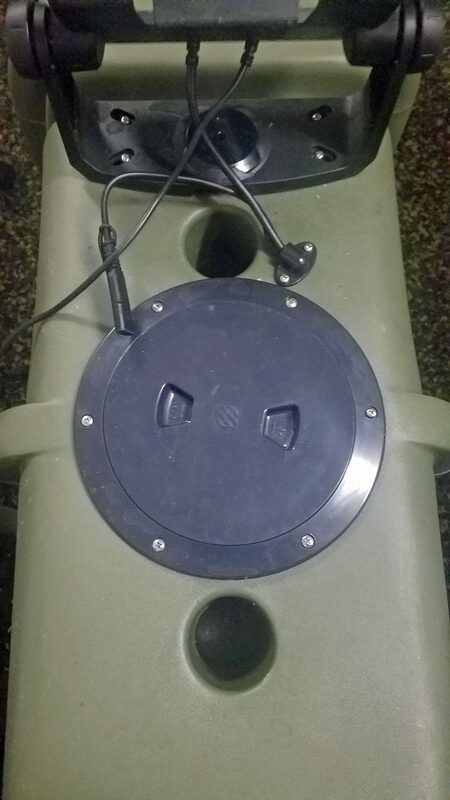 This makes it possible to move the S4 over rugged terrain, rocks and various obstacles. 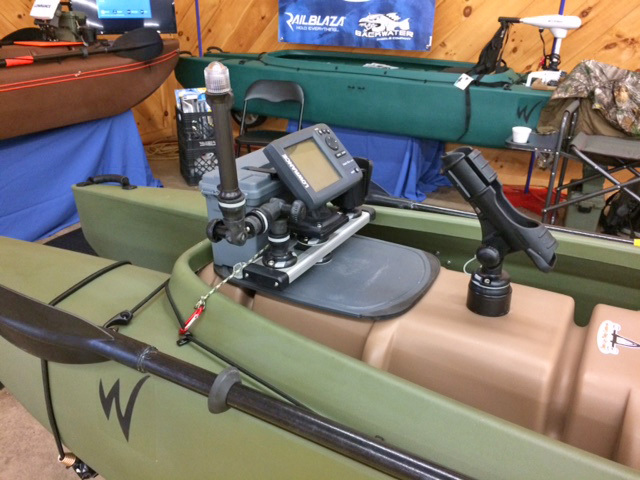 Skiffs and micro skiffs are designed for flats fishing. The problem with these fisheries is twofold – The first challenge is that in low tide, the water can be too shallow even for a micro skiff to move in it, and the propeller is the lowest point in the boat that determines its actual draft. 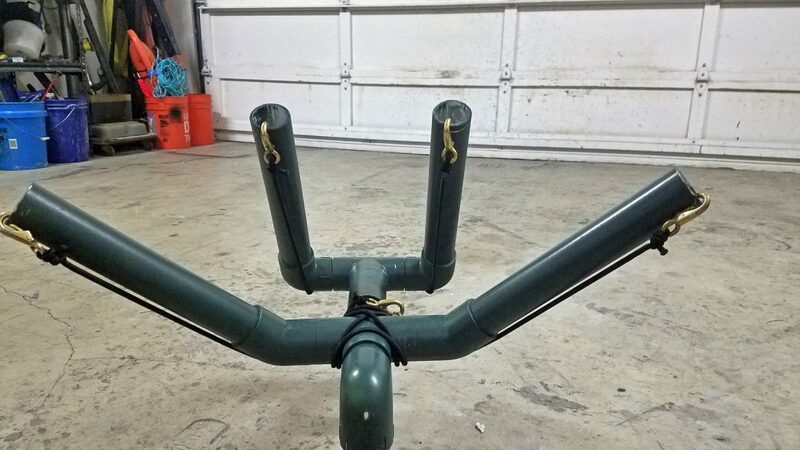 The second problem is vegetation that can get entangled in the outboard’s propeller. In this context, on top of its being a seaworthy boat, the S4 works well with a surface drive, also known as a mud motor. These motors work at sea, and they outperform regular outboards in shallow water, muddy water, and water where much vegetation grows. 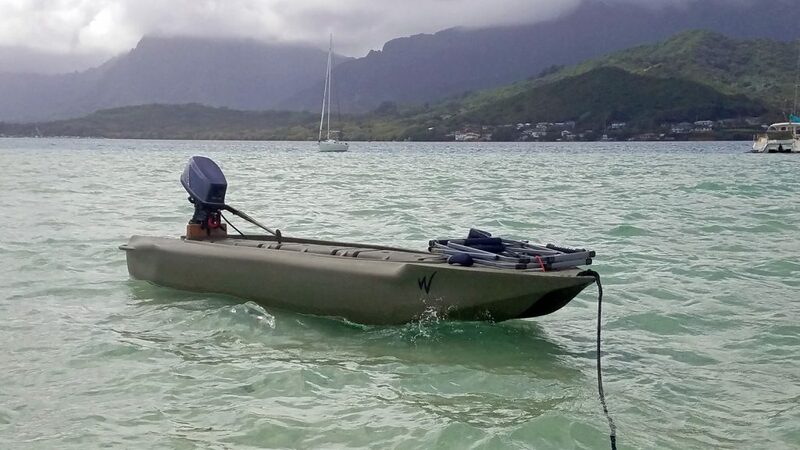 For some anglers, the S4 offers top performance and extreme versatility as a seaworthy microskiff, as well as an all-terrain and all-water boat.